Here is my whole Object Oriented Design Tutorial! The goal of this tutorial is to teach you to make beautiful Object Oriented Designs. I start by creating a Use Case, Object Model, Sequence Diagram and Class Diagram all in the first video. I then turn those diagrams into code and a working program in the second video. 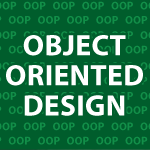 I focus on teaching the Object Oriented Design process in numerous ways in this video series. Links to all of the diagrams and code follow the 11 videos in this series. All UMLet files used are here. Object Oriented Design Tutorial 1 : The goal of this tutorial is to teach you how to create excellent OO designs. In this tutorial, I start off with a programming idea and walk you through the process of creating a Use Case, Object Model, Sequence Diagram and Class Diagram. Object Oriented Design Tutorial 2 : In this tutorial, I show you how to turn those diagrams into code and a working program. This is the process a person goes through to create excellent Object Oriented Designs. Object Oriented Design Tutorial 3 : In this part of the tutorial, I’ll cover Iterative Development, The Unified Process and Usage Cases. Object Oriented Design Tutorial 4 : I show you how to plan your first iteration. I explain all of the parts of the Elaboration phase of Object Oriented Design. I also convert the Use Case into a Domain Model. Object Oriented Design Tutorial 5 : I take you through the creation of a sequence diagram using all of the diagrams I made before it. Object Oriented Design Tutorial 6 : In this tutorial, I’m going to simulate the process of creating a sequence diagram in a group atmosphere. I’ll improve the last design, while explaining what I’m thinking. I’m also trying to teach how to think through a programming problem while creating the sequence diagram. Object Oriented Design Tutorial 7 : I’ll show you how to convert a Sequence Diagram into a Class Diagram. Object Oriented Design Tutorial 8 : I’m going to show you how to convert the Sequence Diagram into working code. Object Oriented Design Tutorial 9 : Here I’ll finish turning sequence diagrams into code. If you get good at this process you’ll be able to make any program no matter how complicated it may be. Object Oriented Design Tutorial 10 : I cover GRASP, or General Responsibility Assignment Software Patterns. GRASP defines rules you can use to decide which objects should have which responsibilities in your Object design. I cover the following rules: Creator, Expert, Coupling, Controller and High Cohesion. Object Oriented Design Tutorial 11 : This time talk about Polymorphism, Indirection and Protected Variations. They show how you can create flexibility in your system in different ways by having different classes implement interfaces. I also talk about Pure Fabrication, which shows the importance of separating out code that impedes low coupling. UML Video Tutorial : ( 9 Videos ) Unified Modeling Language (UML) is a graphical way of describing software systems. In this tutorial series, I cover Use Case, Activity, Class, Object, Sequence and many more UML Diagrams. I can’t think of anything more important for a good programmer to understand than UML. With it you’ll be able to create first class Object Oriented Designs. Those designs will allow you to create anything you can imagine. Design Patterns Video Tutorial : ( 26 Videos ) Here are all 26 videos from the Design Pattern Video Tutorial. Design patterns provide a reusable solution to commonly occurring software problems. Through the study of them you will dramatically increase your development time and improve code readability. Java Video Tutorial : ( 64 Videos ) A long time ago I started my Java Video tutorial. When I started this I wanted to completely cover the Java language. So, far I’ve recorded over 64 videos that are over 14 hours in total length. I’m not near done with this tutorial, but I thought it would help if I combined all of these videos in just one post.